.243 WSSM – The Long-Awaited 6mm? Despite their wide-spread use as sniper cartridges, the .223 Remington, .308 Winchester, and .300 magnums are arguably less than ideal. Each has inherent limitations which reduces its effectiveness, and many in the sniping community have long awaited a better “answer”. One possible “answer” that has repeatedly resurfaced during this search has been the prospect of a high-velocity 6mm cartridge. In the past few years Winchester and Remington have offered several new short magnum cartridges, one of which may be that “answer”. This article compares the .243 WSSM’s ballistic performance to current service cartridges, discusses the range of .243 WSSM options available to the tactical marksman, and speculates on options that may be available in the near term. While each has its place in both personal and tactical arsenals, the .223, .308., and .300s have ballistic, logistical, and other limitations. In order to better understand the potential of the .243 WSSM, it would be helpful to first review the strengths and weaknesses of the existing cartridges. The following evaluation is by no means complete, and some characterizations may be open to debate, but it serves as a good starting point for this discussion. The .223’s velocity affords it a relatively flat trajectory out to 400m, and repeatable hits at 600m are within its capability if the winds are steady, but it offers little beyond those ranges. Its terminal ballistics is very velocity-dependant and as it decelerates it loses much of its wounding potential. These limitations spurred the military to develop the 6.8mm cartridge which, while an improvement over the .223, is by no means the above-described “answer”. The .223’s chief asset as a sniping cartridge is that AR-15 platforms are chambered for it, allowing the sniper to use a semi-automatic rifle if he chooses, the spotter to have a weapon in the same caliber, simplified logistic and repair concerns, and less re-training regarding operation and maintenance. In addition, the .223 has very little recoil, reducing problems with training and flinching. The most popular sniping cartridge is the .308. Its popularity is based on the facts that it was at one time the standard round for our service rifles, it has excellent inherent accuracy, and it has only moderate blast and recoil. Having served most western militaries for over four decades, it has accrued an enormous amount of loyalty and institutional momentum, and will no doubt remain in service for years to come. It does, however, have some profound limitations. The greatest of these is its trajectory. Owing to its relatively low initial velocity, the .308 has the steepest exterior ballistic arc of all of the sniping cartridges in service. Snipers have learned to compensate for that trajectory with accurate range-finding and extremely precise use of data, but those efforts don’t cure the problem, just reduce the symptoms. In addition, its relatively low velocity makes the .308’s bullets more susceptible to the wind’s effects, and while the use of observational and calculated data, as well as bullets with higher ballistic coefficients, mitigates some of that effect, the problem still exists. In an effort to alleviate the .308’s trajectory and wind-bucking problems many snipers employ .300 magnums. Their higher muzzle velocity and heavier bullets with better BCs allow them to shoot significantly flatter and buck wind better than do .308s. At most distances a sniper using a .300 needs to apply only approximately 75% of the elevation adjustment and 50% of the compensation for windage required by a .308. These advantages allow snipers using .300s to hit targets at longer range, through worse winds, with greater reliability and repeatability than they could with a .308. However, the .300s have drawbacks. They produce substantially more blast and recoil than do .308s, a combination of effects that can intimidate many shooters, encouraging flinching and reducing inclination to train. The .300s are not cartridges that would be used by other units, perhaps creating logistical problems. And, until Armalite introduced the AR-10 in .300 RSAUM, factory semi-automatic versions were not available for either the sniper or spotter. This consideration of the .243 WSSM is going to focus on the performance of two specific rounds – the 95grain Winchester Supreme Ballistic Silvertip factory cartridge and an as yet unavailable load featuring Berger’s 115-grain Very Low Drag boat tail hollow point. Other factory and hand-loaded options exist, but these two choices represent, in the 95gr SBST, an excellent off-the-shelf option that is immediately available, and, in the 115gr VLD, a potential load that could maximize the performance of this caliber. Before parsing the differences between these bullets, their similarities should be described. 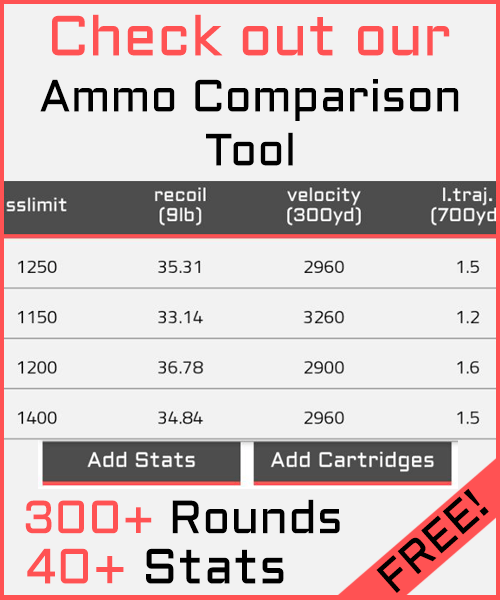 Both options dramatically outperform the .223, .308., and .300 cartridges. As the chart illustrates, with only one exception (.300s buck wind better than the 95gr SBST), the .243 WSSMs in combination with these bullets should outperform the three established sniper cartridges in the three most important phases; trajectory, wind, and the lead required for movers. Put simply, the .243 WSSM rounds shoot faster and flatter than the .300s while having less recoil than the .308. All values are in MOA. Wind values are for a 10mph cross wind at full value. The walker is moving at 4mph at full value. All calculations performed by JBM Trajectory Calculation Page (http://www.mega.nu:8080/traj.html), and assume 55 degrees Fahrenheit at 1,000′ of altitude (averages for the author’s hunting land). SBST ammunition is Winchester’s Supreme Ballistic Silvertip. BTHP ammunition is Federal’s Matchking with Sierra bullets. VLD ammunition is Berger’s Very Low Drag bullet. MC ammunition is Remington’s Metal Case bullet. The 95gr SBST has been loaded in .243win hunting rifles and used to take medium-sized game animals such as mule and white tail deer for years. It has very dramatic terminal ballistic properties combining rapid expansion and deep penetration. For shooters not confined by the Hague Treaty’s prohibition against expanding ammunition, including civilian marksmen and police snipers, the 95gr SBST offers accuracy, a high BC, and excellent wounding potential. Factory and custom bolt-action rifles are available in .243 WSSM, but what really makes this caliber/cartridge combination attractive is that Olympic Arms offers both complete AR-15s and uppers in this caliber, and claims that they will feed all of Winchester’s factory ammunition, including the 95gr SBST (eight rounds of .243 WSSM fit in a 20rd .223 magazine). This allows snipers to employ a semi-automatic sniper rifle in .243 WSSM, or to use a bolt gun in .243 WSSM and have their spotter support them with an AR in the same caliber. In either case, having a semi-automatic rifle that shoots flatter than the .300s, with less recoil than the .308 AR-10/SR-25, mounted on an AR-15 lower, is quite an improvement over the existing options. Despite the promise of the .243 WSSM / 95gr SBST cartridge, there is, hypothetically at least, more performance to be found, especially for military snipers. Berger manufactures an 115gr Very Low Drag boat tail hollow point bullet that would correct the one limitation this cartridge has compared to the .300s, ability to buck wind. The 95gr SBST is more adversely affected by wind than are the .300s, but the Berger bullet is much less so. In fact, the 115gr VLD is deflected so little that its windage figures are nearer to the .338 Lapua than they are the .300s (see chart). The 115gr VLD bullet is too long to fit in AR-15 magazines, but there should be no reason why a .308 manufacturer such as Armalite, Bushmaster, DS Arms, Springfield Armory, or DPMS could not modify a .308 receiver to accommodate it. M14 and FAL magazines should accept the lengthier cartridge, and the resulting weapons would have very little felt recoil. Military snipers who are used to sending 175gr or 190gr bullets at their enemies may consider an 115gr projectile too small, but a hit causes much more damage than a miss, and in challenging wind or UKD environments the advantageous ballistics of the .243 WSSM / 115gr VLD cartridge could result in a hit when other combinations miss. A whole lot of assumptions and computer-driven data went into these claims, and someone, or, better, many some ones, need to prove or disprove them in the field. Olympic’s .243 WSSM is selling well, as are Winchester’s bolt guns, so there should be more and more shooters available to share ballistic data. Issues of barrel life, magazine and feed reliability, maintenance, and so on also need to be discussed. The .243 WSSM / 115gr VLD cartridge should be fully investigated as it represents a substantially more effective option than the 6.8mm currently being adopted by our military. If our troops truly need an intermediate-range AR upper, perhaps we can do better for them on a second try. And, in addition to this particular short magnum, there are many others available or soon to be released. It may be that another caliber, the .25 WSSM, for instance, is actually nearer the “answer”. The .243 WSSM, in conjunction with two particular bullets, the 95gr SBST and the 115gr VLD, might represent a leap forward in ballistic performance for snipers. Its flat trajectory, low recoil, and ability to feed through AR style rifles is a unique tactical combination that needs to be investigated further.